NBRS Architecture has been appointed to the Batemans Bay Aquatic and Arts Centre project. Photo: Eurobodalla Shire Council. 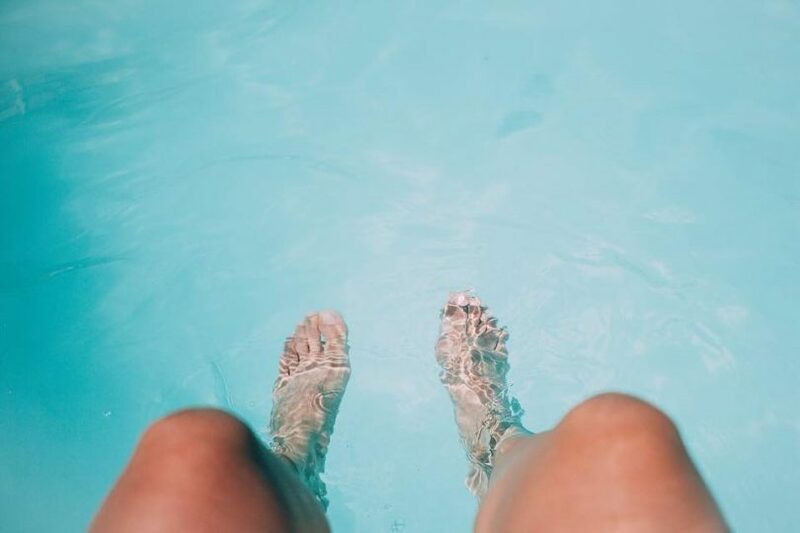 Close to 100 community groups will soon be invited to work with the Sydney-based architects commissioned to design the new Batemans Bay Aquatic, Arts and Leisure Centre at Mackay Park. 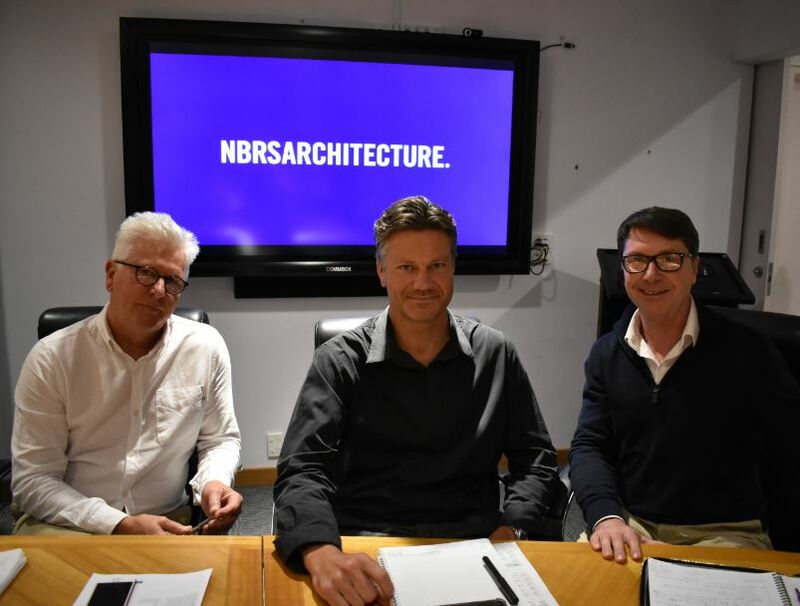 NBRS Architecture has won the prestigious job with Eurobodalla Shire Council and will partner with Donovan Payne Architects, who are specialists in aquatic and sporting facilities. Council says, NBRS Architecture, which recently celebrated its 50th anniversary, has extensive experience in creating inviting spaces that serve communities. Past projects include the award-winning Murray Art Museum in Albury, refurbishment of the Ruth Everuss Aquatic Centre in Auburn, the Hillsong Epicentre Studio in Baulkham Hills and the Taronga Institute of Science and Learning. Donovan Payne Architects Founding Director Kim Donavan, NBRS Architecture Life and Culture Studio Principal Andrew Tripet and NBRS Director James Ward recently visited the Eurobodalla to meet with Council representatives and tour the site of the new Batemans Bay Regional Aquatic, Arts and Leisure Centre. Photo: Eurobodalla Shire Council. NBRS Architecture Principal Andrew Tripet says his firm is passionate about human-centred design. “We’re intensely interested in community and society, and particularly how people gather, react and enjoy public spaces,” Mr Tripet says. Council says user groups of the facility will be invited to participate in focus groups with the architects later this month so that their needs can be reflected in the final design. The 96 groups already identified include local sporting clubs, arts groups, community groups and associations, the business sector, schools, swimming groups, health and disability groups. The wider community will be encouraged to have a say on the final design once concept designs are finalised, which is expected to be before January 2019. In the meantime, Council is inviting people and groups to submit their thoughts by emailing council@esc.nsw.gov.au before Wednesday, October 31. The new indoor year-round aquatic centre will replace the existing 50-metre outdoor pool at Batemans Bay. 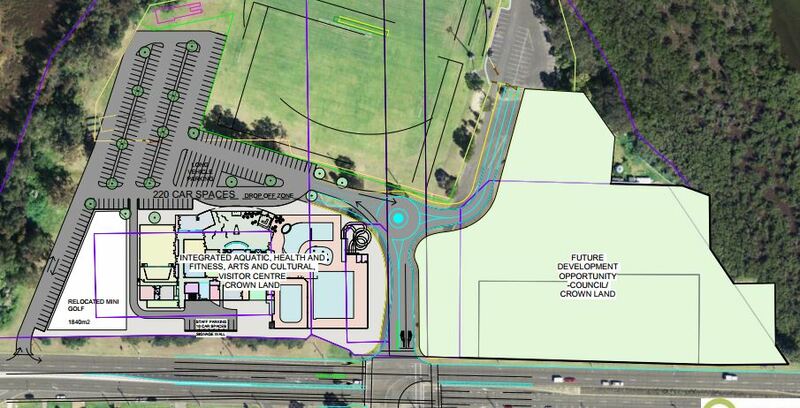 Council’s plans for a new aquatic and cultural centre for Batemans Bay, adjoining the old Batemans Bay Bowling Club site earmarked for future development. Photo: Eurobodalla Shire Council. The preliminary concept includes an aquatic centre with a 25-metre, ten-lane pool with ramp access; separate 10m warm-water therapy pool and spa; freeform indoor leisure pool that includes learn-to-swim and toddler areas; water-play splash pad; waterslides; gym, group fitness and wellness area. The arts and cultural centre will be a large flexible, flat floor auditorium with retractable seating for up to 500 people, plus dressing rooms, green room and storage, gallery/exhibition space and storage, rehearsal/dance studio/music room, ‘wet’ arts workshop space and storage, ‘dry’ arts workshop space and storage, meeting and multi-purpose rooms. Shared facilities including a foyer, café, visitor information service and associated retail, administration offices and support services. Some in the community have argued for the retention of the 50-metre pool. In March this year, the NSW Premier, Glady Berejiklian travelled to Batemans Bay to commit $26 million towards the new centre. Council is hoping the Commonwealth will help cover the $20 million shortfall.